Summer thunderstorms can be exciting, but they also have some health effects you may not know about. The summer thunderstorm is great theater. Lightning seems like it might have been hurled by the hand of an angry god. If it's close, we're treated to the sharp crack of thunder that makes us jump and the dog hide. And if it's far away, there's that heavy kettledrum rumble. The wind whips through. The rain comes in a frenzy. And when it's all over and the storm has passed, we're often treated to some of the season's most delectable weather. Of course all this presumes a view of the proceedings from somewhere inside. Being outside, with the thunder and lightning, can be perilous — and very, very wet. But even if you stay indoors, thunderstorms are associated with some adverse health effects. The classic example is the arthritis that acts up, although that may be a psychological phenomenon. Researchers have documented thunderstorm-related outbreaks of asthma, and there are hints that storms could cause lung and sleep apnea problems. So, starting with lightning, the most obvious threat, here are some of the hazards associated with thunderstorms. You can still enjoy the show, but may be a little more wary the next time one rolls through. Lightning strikes occur because the bottom part of a thundercloud acquires a negative charge relative to objects on the ground. Downward "leaders" from the charged clouds carve out columns of heated, charged particles in the air. These leaders get longer and longer, till their tips are within 30 to 50 yards of the ground. When a connection is finally made to the positively charged ground, or an object on the ground, a huge amount of current flows out of the cloud — and in a flash — there's a lightning strike. Lightning strikes are common, occurring 20 million times a year in the United States. June, July, and August are the peak months, except in the Southeast and especially Florida, where thunderstorms and lightning happen year-round. The prime time of day for lightning strikes is between 3 p.m. and 5 p.m., after the sun has had a chance to heat up the air and create the updrafts that form thunderclouds. One of the many misconceptions about getting hit by lightning is that it's inevitably fatal. In fact, most people live to tell the tale. On average, about 60 Americans die each year from lightning strikes, but four to five times as many survive, although the injuries can be quite serious. Another myth is that people burst into flames or, at the very least, get severely burned by lightning. In truth, there's a "flashover" effect that keeps much of the current outside the body. Moisture on the skin may vaporize instantaneously, leaving behind first- and second-degree burns. Sometimes clothes and shoes get blown off, so the person is left nearly naked. But the flashover effect is also a lifesaver and makes deep tissue burns from lightning a rarity. Cardiac arrest, not burns, is the most common cause of death from lightning because the electricity scrambles the electrical system of the heart. We also tend to have the mistaken idea that the only danger is from a direct strike. The massive current from a lightning strike can travel through the ground and, seeking the path of least resistance, travel through a person standing nearby. People also get hurt by "splashes" of lightning. Lightning can splash from one person to another and from a tree to a person. Even when people are inside, they can suffer splash injuries from indoor plumbing or telephone wiring that has been electrified by lightning. Survivors of lightning-related injuries may end up with an assortment of neurological and eye problems. Many victims experience bad, unrelenting headaches for several months. The concussive force of lightning can cause the kind of blunt trauma that people experience when they fall, get hit, or are involved in a car accident. The chances of any one of us getting injured by lightning during our lives is vanishingly small. But if you're outside when a storm comes through, you want to make a small chance even smaller. Here are five suggestions from a review article on lightning injuries written by Drs. Medley O'Keefe Gatewood and Richard Zane at Harvard and published in 2004 in Emergency Medicine Clinics of North America. Seek shelter in a car or bus. If a car or bus gets hit, the electrical current stays on the outside of the metal shell of the vehicle. Rubber tires have nothing to do with the protection. Seek shelter in a large structure. Small buildings such as bus shelters or huts on golf courses may actually increase the risk of lightning injury if they are the tallest objects in an area. Tents may also be a danger because the metal poles could act as lightning rods. Stay away from clearings and single trees. If you are in the woods, don't head for a clearing because you'll be the tallest object. Take cover in an area with small trees or bushes. And if you're in an open area, don't stand near an isolated tree or group of trees that could attract a strike. Instead, find a low-lying area and assume the "lightning position": squatting with feet together and hands over the ears to protect against acoustic trauma. Gatewood and Zane said kneeling or sitting cross-legged would also be okay, since squatting can be uncomfortable. Don't wait till the clouds are overhead. Lightning can travel horizontally 10 miles or more in front of the storm clouds producing rain, so a strike can seem to come, literally, out of the clear blue sky. One rule of thumb is to seek shelter when the time between seeing lightning and hearing thunder is 30 seconds or less. Another one is not to resume outdoor activities until 30 minutes after the last lightning is seen or thunder heard. Avoid faucets and landline telephones during a storm. Plumbing and telephone wires can carry current from a lightning strike. If you want to be super cautious, you should turn off electrical appliances and devices like computers before the brunt of the storm arrives. Reports of thunderstorm-related asthma go back to 1985 to a report in The Lancet about a sudden spike in asthma patients in Birmingham, England, after a July thunderstorm. There have been reports since from Australia and Canada. Researchers in Georgia investigated the relationship between the 564 thunderstorms recorded at the Atlanta airport between 1993 and 2004 and over 200,000 asthma-related emergency department visits at hospitals in the area. They found a real, if modest, 3% increase in asthma-related visits on days following thunderstorms. The people affected by thunderstorm asthma almost invariably have seasonal allergies — otherwise known as hay fever — which means they're prone to having an allergic reaction to pollen, fungal spores, or both. And the episodes of thunderstorm asthma have been associated with high pollen and spore counts. So how might thunderstorms increase pollen and spore counts? Thunderstorms are created by updrafts of warm, humid air. When that rising air cools off at the higher altitudes and the humidity condenses into rainfall or hail, it creates downdrafts and outflows of cool, dry air that race ahead of the storm and the rainfall. Most of us have experienced that ominous drop in temperature and the gusts of wind that signal the approach of a thunderstorm. According to one theory, those gusts whip pollen off of grass and trees. 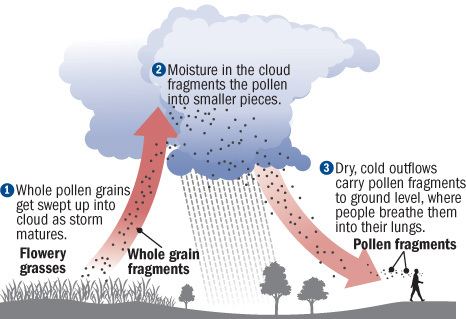 Another, more elaborate explanation is that pollen (and possibly spores also) first gets swept up into the storm clouds where moisture ruptures the pollen grains into smaller fragments, which then get transported down to ground level by cool downdrafts and outflows (see the illustration). The electrical activity associated with thunderstorms may also play a role in breaking up the pollen into smaller pieces. This explanation takes into account the assertion that whole pollen grains aren't likely to cause asthma because they are too large to get down into the narrow airways of the lungs. It also explains why some people claim that they can tell a thunderstorm is coming by the worsening of their asthma symptoms. Many people with arthritis are convinced that the condition acts up and causes more pain when the weather gets bad. For the most part, research has debunked that belief. Psychologists have ascribed it to selective matching: an inclination to see and remember salient coincidences and to ignore contradictory evidence. In the case of arthritis and bad weather, people may notice changes in weather when they have more pain because of the prior belief in a connection, but don't notice when their joints are feeling fine. In 2007, Tufts-New England Medical Center researchers reported findings that go against the grain in two ways. First, they found a connection between the weather and reports of arthritis pain among 200 people who had participated in a clinical trial of glucosamine. Second, knee pain increased not with the falling barometric pressure that's associated with stormy weather, but with the rising barometric pressure that usually comes with clear skies. Their explanation: severe deterioration in weather is often accompanied by fluctuations in barometric pressure. A lung collapses when air gets into the space between the lungs and chest wall and pushes on the lung so it loses its shape. The medical term for the pocket of air is pneumothorax. Anything that punctures or tears the lung — a broken rib, for example — can cause a pneumothorax. But often there's no obvious violation of the lung. These spontaneous pneumothoraces often occur because weak spots in the wall of the lung give way, allowing air from the lungs to escape. Researchers have documented that hospital cases of spontaneous pneumothoraces occur in clusters. And it's understood that large air pressure change outside the body from, say, scuba diving or airplane travel can trigger a spontaneous pneumothorax. So a handful of researchers have investigated whether much smaller, weather-related decreases in air pressure might be associated with pneumothoraces. If air pressure is low, air trapped inside the alveoli of the lung might expand and put pressure on the lung wall. The results of these investigations have been mixed. In 2000, Dutch researchers found no connection between falling air pressure and spontaneous pneumothoraces in Amsterdam. Italian researchers who conducted a similar study in Bologna, Italy, more recently did. But both groups saw a pattern of thunderstorms occurring on days just before the clusters of pneumothoraces. One explanation is that asthma brought on by thunderstorms might cause pneumothoraces. The humidity and wind of thunderstorms may also bring about changes in the lungs (mucus retention, bronchiolar spasm, cough) that add up to make spontaneous pneumothorax more likely. People with sleep apnea repeatedly stop breathing for short periods while they're asleep. Serious cases put a strain on the cardiovascular system and increase the risk of heart attack and stroke. In 2010, researchers reported the results of a study of 537 apnea patients at the University of Washington Medicine Sleep Institute in Seattle. They checked apnea patterns of the patients while they were in the overnight sleep clinic against barometer readings during those stays, and found that the number of obstructive sleep apnea "events" — instances when breathing was interrupted — increased on the nights when atmospheric pressure was lower. Thunderstorms weren't part of this study, but falling atmospheric pressure is a common feature of most storms. Obstructive sleep apnea is usually caused by soft tissue in the back of the throat relaxing and blocking the normal flow of air. Atmospheric pressure may help hold those tissues open a little bit, so when pressure falls, they relax and interfere with breathing.